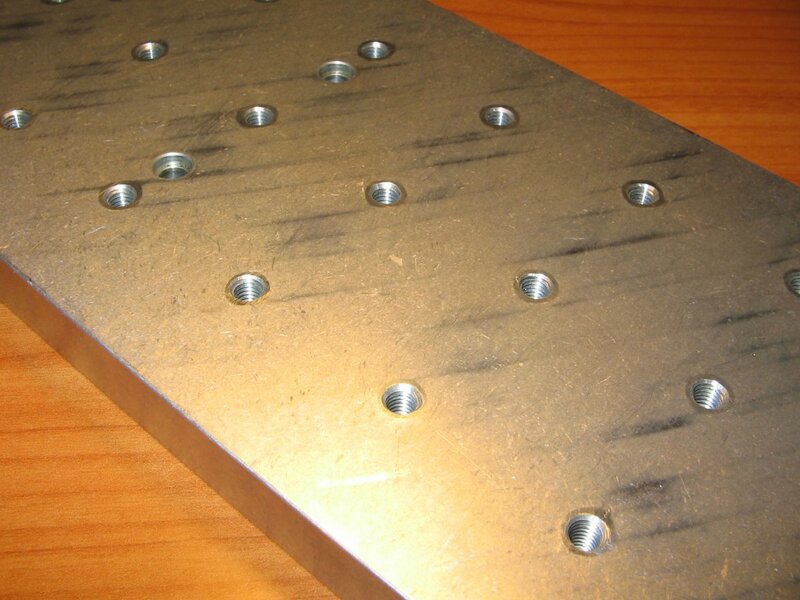 Having a tooling plate is almost a must for anyone that owns a Sherline milling machine. It helps to protect the table and can be adapted to specifics needs. When I bought mine (A2ZCNC brand), I don’t worry about how well aligned the top surface was; I supposed it was good enough. But someday I took some measurements, and this is the history. 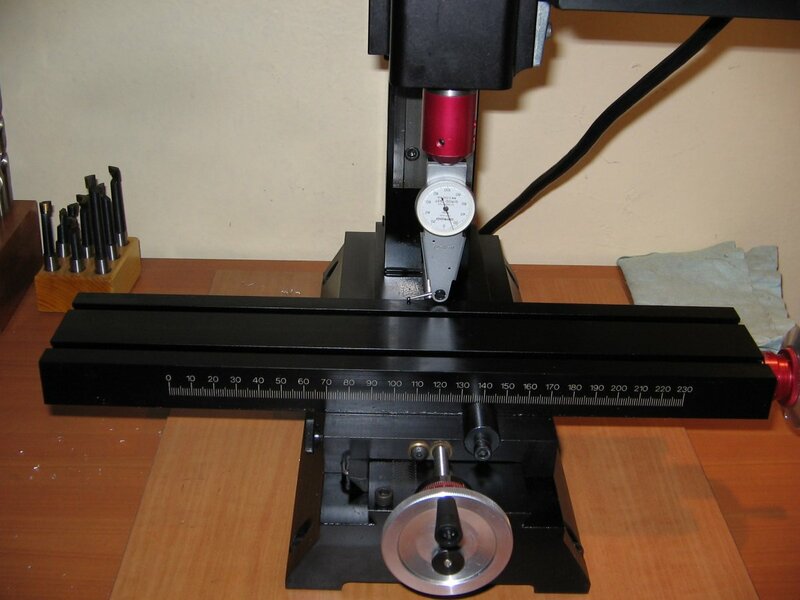 Please note this this is not a review about the mill or the tooling table precision, but rather some reference information. 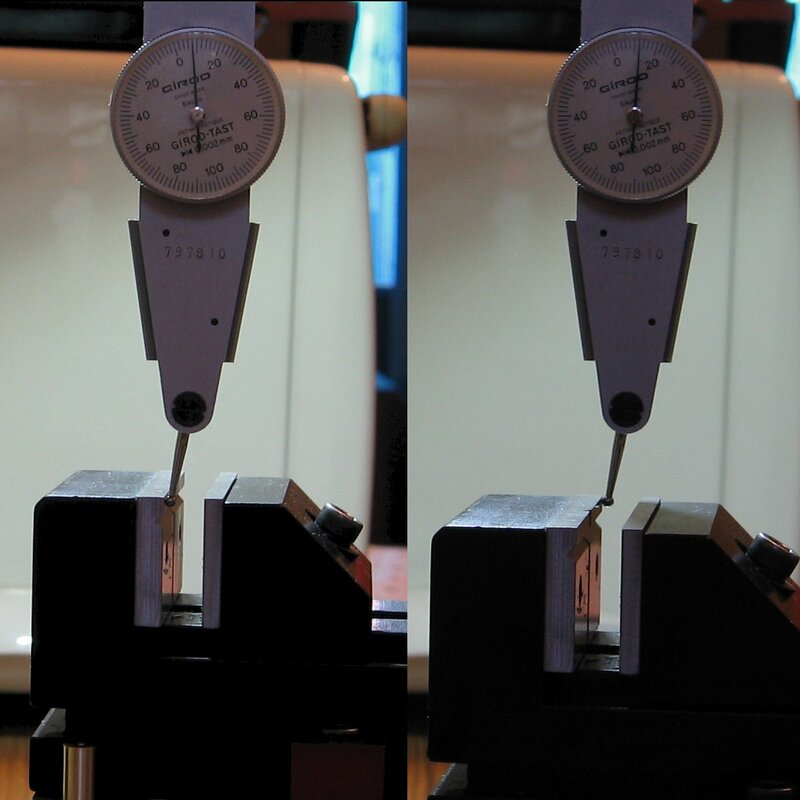 So there’s a small tilt on the X axis (around 0.0243º); I don’t know usual this is, but I was not happy with that. Please note this is a three year machine, used lightly, so this wasn’t caused by worn or misuse. I’m really not able to measure how flat the plate is, so I only took a few thick measurements using a digital micrometer. 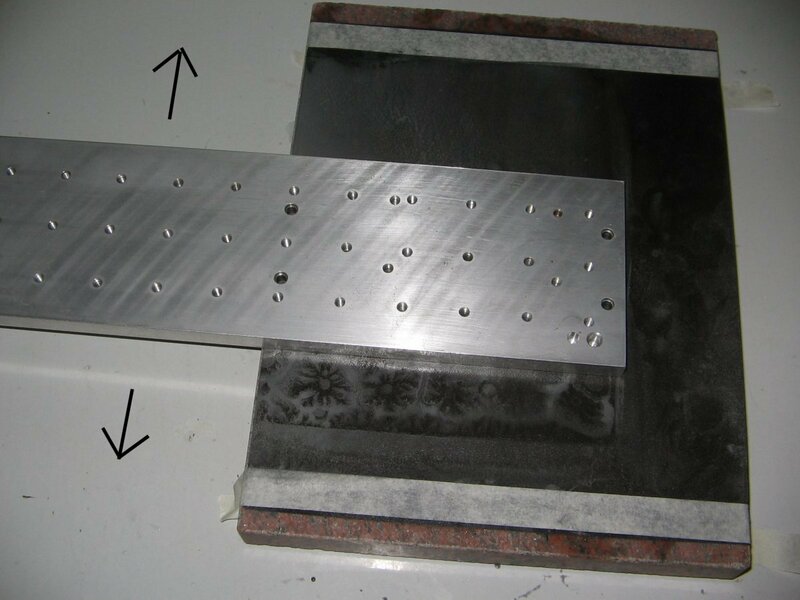 Here’s what I get with the installed tooling plate, after filing bottom protroudings (see below). After that I search for a way to enhance this numbers. Flattening tooling plate sole. Bottom side of tooling plate holes seemed to have protruding sourrondings. I’ve noticed this before but didn’t take care as if protruding were equals this wouldn’t, at least in theory, have any effect . But one day I noticed some round marks left on the mill table, so I just pick up a file and take out protrudings (I used a small flexible flat file). Padding. 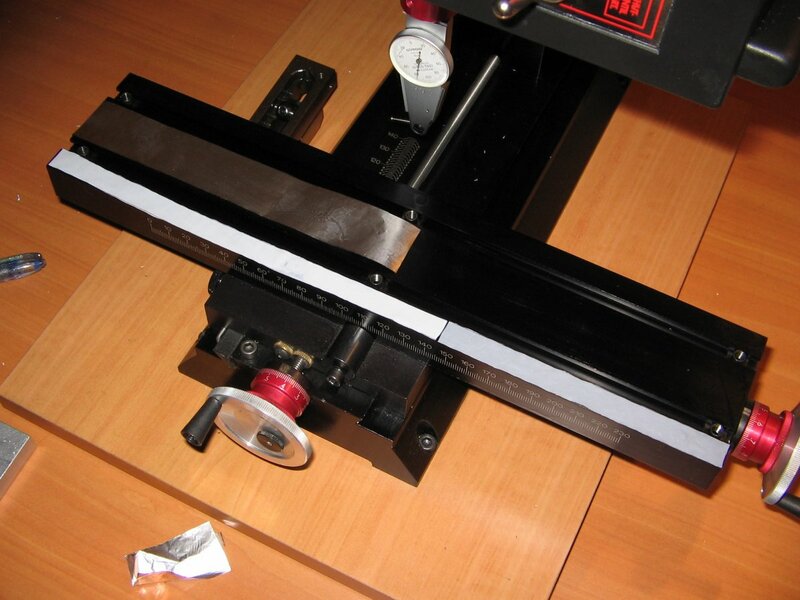 To enhance top surface alignment, I cut some nylon and aluminum foil and play a while. Here is the best I got after this tweaks. Padding was a rather ugly solution, so after some weeks I choose to face mill the plate surface. 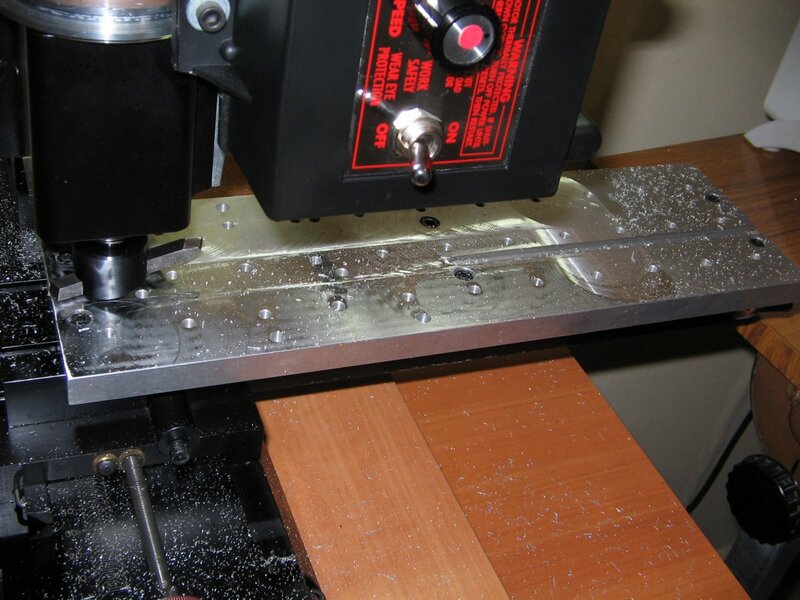 This was a two-step process, as tooling plate area is larger than max milling area. Please note this was done to fix a milling table issue, not related to the tooling table itself. After milling lapping was required, so I just pick some 350 and 500 grit sand paper and begin the process. 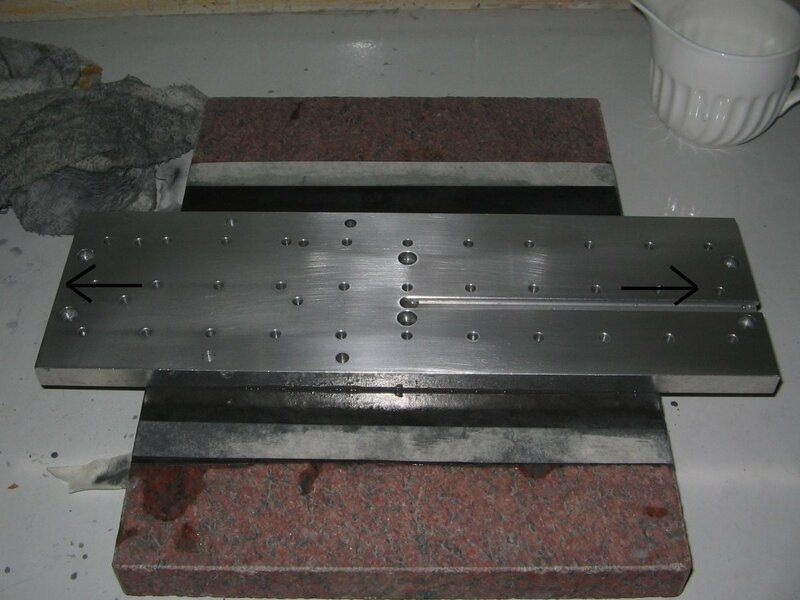 A recently acquired cheap granite surface plate was used as lapping surface. After around an hour, I got a nice finish, so I tested, and surprise: borders where lower than center area. This was in part, I think, due to the fact I did most of the lapping work in perpendicular direction; bad idea. Anyway this lapping process will always take a little more material from the borders; to compensate for this an abrasive area smaller than the plate should be used (not showed here). Fixing this required several hours of hard work and and continuous test. Here is the final result. A final tip: here is how I clean dust in threads. Aligning of the milling vise is a tedious process, so to avoid this, or at least to help, I bored some holes and turn some pins. Two pins at plate sole to fix the table, two to align the vise at center and two to align the vise at the left. 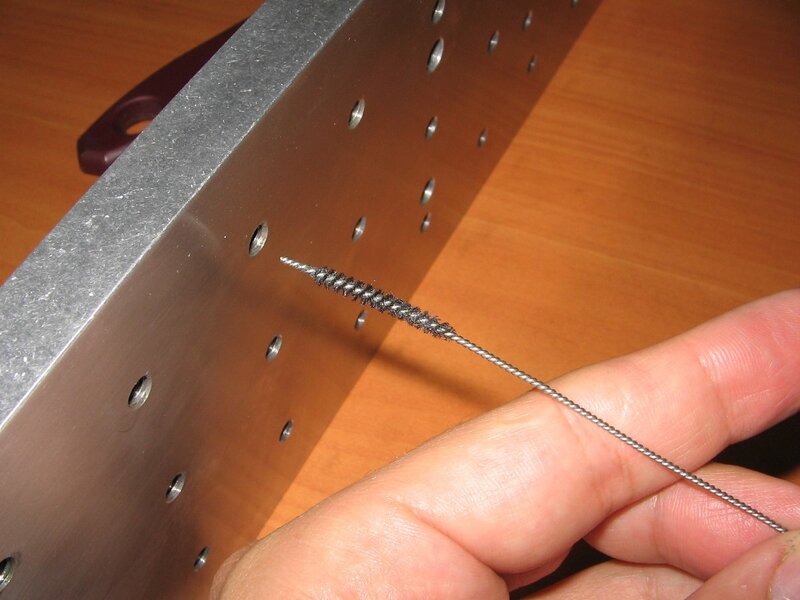 Boring precise holes it’s not and easy task. 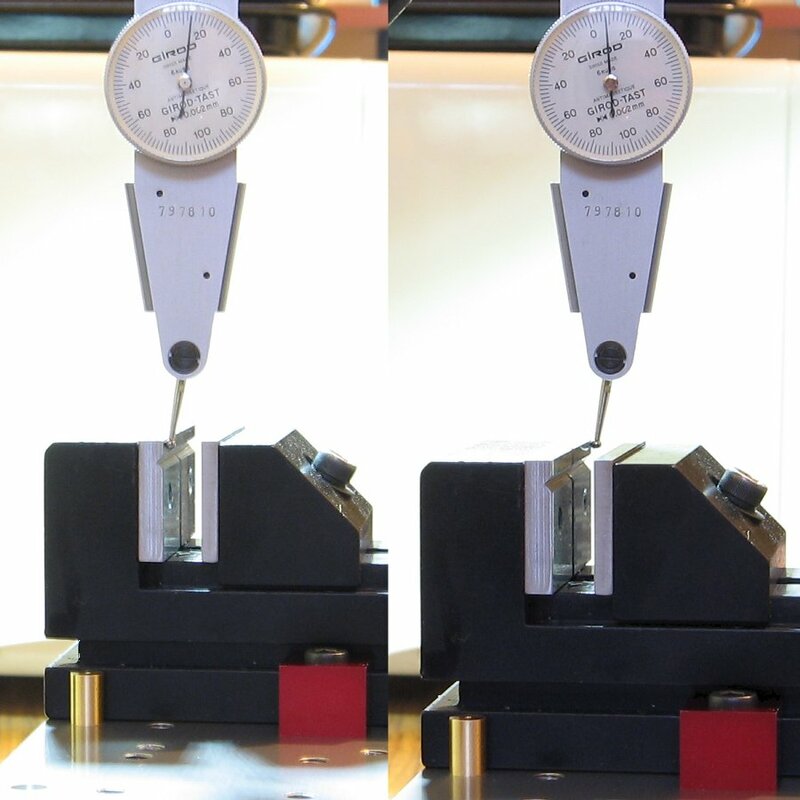 Hole position must be carefully calculated, and fitting must be tight enough to avoid pins fall apart, and lose enough to allow to remove and put them back by hand. Having this on mind, some micrometers more or less can make the difference. I fail the first time in bottom holes, and the top left holes ended with a little play. As show below, align is ok for most of works (this is a 2um indicator). 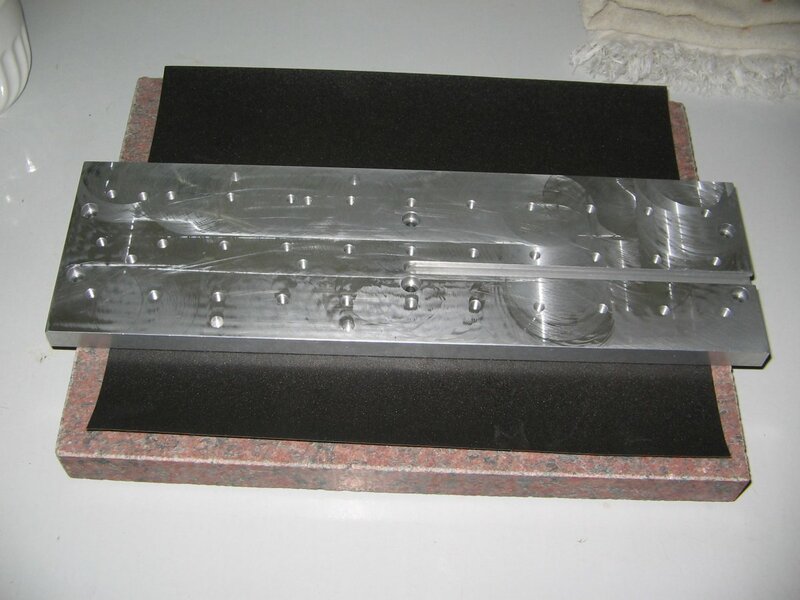 It’s clear that in the manufacturing process of the tooling plate lapping was done first and threading later, leaving the undesired protroudings. To correct this, filing and/or lapping can be used. I’ve said there were protroudings at the sole, but the top surface also had small protroundings (10 um, not noticeable by eye). I recently bough a Sherline tooling plate (for another machine), and in this is clear that lapping (or some kind of surface grind) was the final step; in fact, the plate comes with some fine dust. 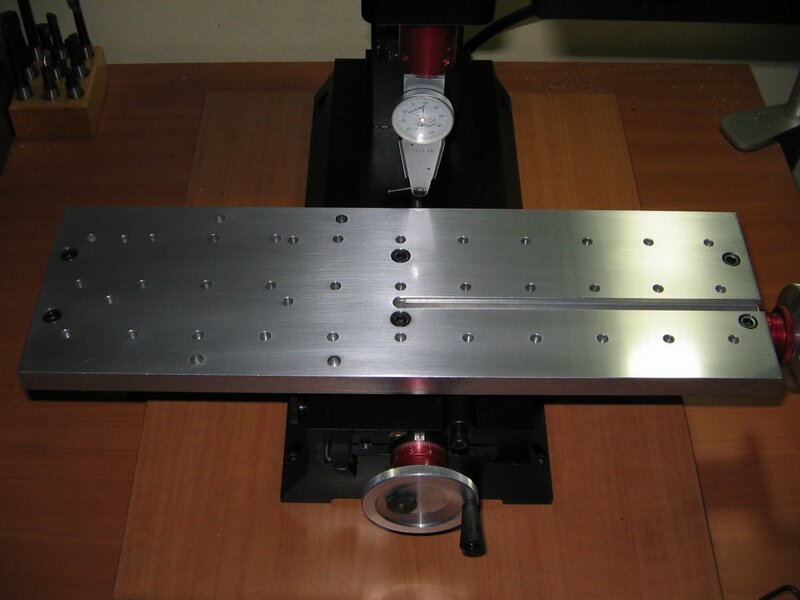 In regard to the milling table tilt, may be this is within expected tolerances for this machine, but must be corrected to help to machine precision parts; 28 um it’s a lot. After a lot of work I got acceptable tolerances and a nice finish. 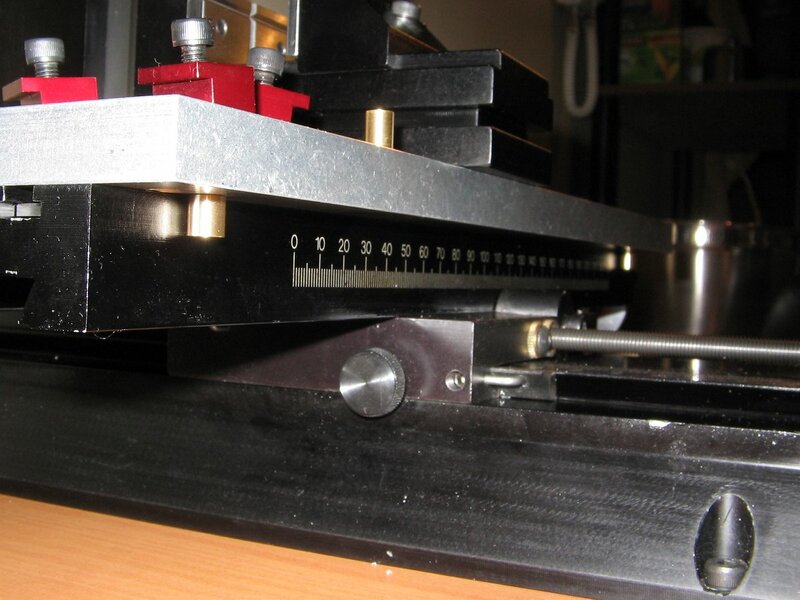 Its clear that now this tooling plate should be used only in this machine and in the same position always, but this is not a problem. It would be interesting to hear about similar measurements from others, may be I was unlucky, or may be I’m expecting to much precision from this things. This of course doesn’t change my concept about Sherline products as high quality, super nice machines; in fact I’m getting parts for the cnc version of this mill.